For many centuries, blacksmiths had produced weapons in times of war, and ploughs, carriages or metal tools in times of peace. Often - when large quantities of weapons or tools were required - several blacksmiths joined forces to live up to demand. In 1863, in the Small Heath area in Birmingham, England, some 14 gun makers merged into the " Birmingham Small Arms company " ( BSA ) to produce rifles for the British forces. From 1881 onwards, BSA started to produce there own bicycle models since demand for guns had declined. This evolved in producing an experimental motorcycle in 1903, using a Belgian 233cc Minerva Engine and by the end of the decade, BSA produced its own machines. The army had seen the benefits of using cars and motorcycles in service and BSA became one of the suppliers of machines during the first world war, alongside Triumph, P&M ( Phelon and Moore ), Douglas and many others. During the twenties, demand for cars and motorcycles grew steadily and the BSA name soon became well-known around the world. 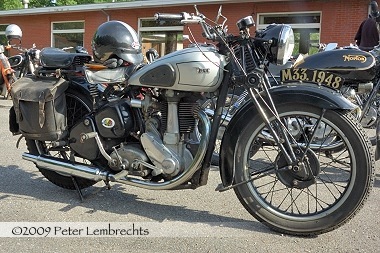 After the recession in the nineteen thirties, BSA recovered well and offered a very complete model range. 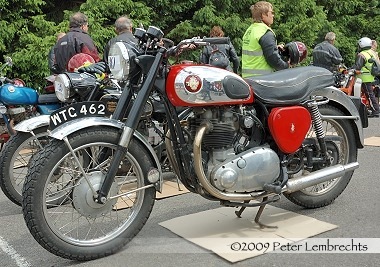 In 1951, BSA accuired Triumph Motorcycles, what made it the largest motorcycle manufacturer in the world. By the mid- fifties however, competition from small cars and cheaper import machines forced many motorcycle producers to join into cooperations, but many factories had to close down. The pictures on this page show some of the postwar models. The 500cc M20 and 600cc M21 were produced from 1937 onwards ( M20 until 1957, M21 until 1963 ) and had been delivered in large quantities during the war. After the war, many of these WM20 and WM21 models were sold to the public, but new machines were produced as well. Above is an early postwar M20 De Luxe model. 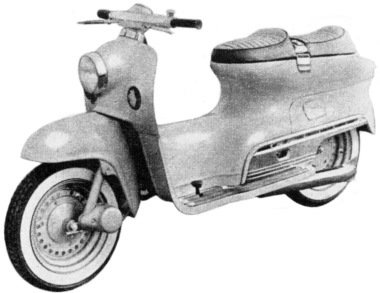 Later models had telescopic front forks and plunger type rear suspension. 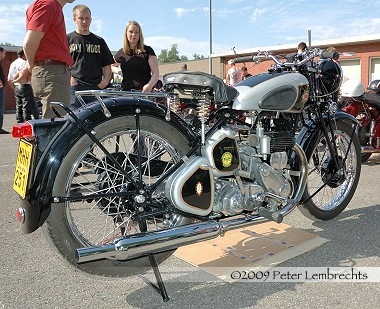 Above: An early 1948 BSA M33. The M33 was some sort of a factory-built " hybrid ", using M20 cycleparts and the engine of the 500cc B33. Later that year, telescopic front forks were introduced. 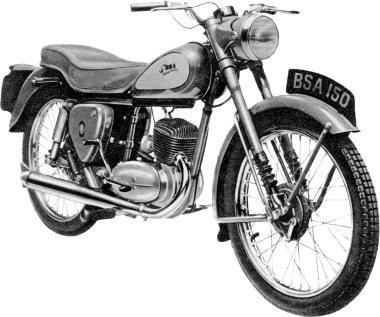 A copy of the German DKW RT 125 ( as was the Harley Hummer, Yamaha YA-1 and others ), the BSA Bantam was a popular two-stroke, built in 125, 150 and 175cc versions. Pictured here is the 1956 150cc Bantam D3, featuring swinging arm rear suspension. 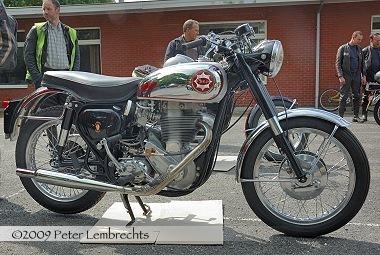 One of the many twins produced by BSA: a 1959 646cc A10R Super Rocket. A model with tuned A10 engine in a Gold Star frame was called the A10 RGS Rocket Gold Star. In the 1964 Grand Prix, Motocross legend Jeff Smith rode a B40 (bored to 420cc) to victory and repeated this in 1965. It was the last 4 stroke machine to win the GP for many years.. 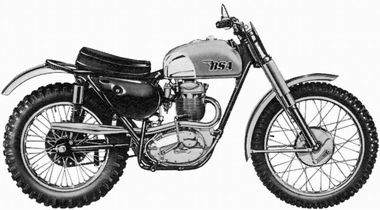 The image above shows the B40' s successor: a 1966 441cc B44 Victor Grand Prix Motocross machine. 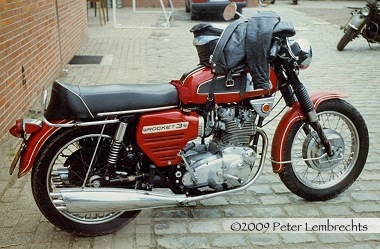 Above: The BSA Rocket 3, a 750cc triple, was produced from late 1968 to mid- 1972 when BSA closed down. The similar Triumph Trident was produced until 1975.